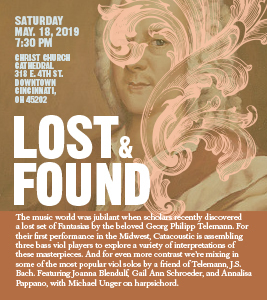 The music world was jubilant when scholars recently discovered a lost set of Fantasias by the beloved Georg Philipp Telemann. For their first performance in the Midwest, Catacoustic is assembling three bass viol players to explore a variety of interpretations of these masterpieces. And for even more contrast we’re mixing in some of the most popular viol solos by a friend of Telemann, J.S. Bach. Featuring Joanna Blendulf, Gail Ann Schroeder, and Annalisa Pappano, with Michael Unger on harpsichord.